She is like the Archie Bunker of Paris. Don’t give her your hipster-Brooklyn complaints about gentrification, because she does not want to hear them. 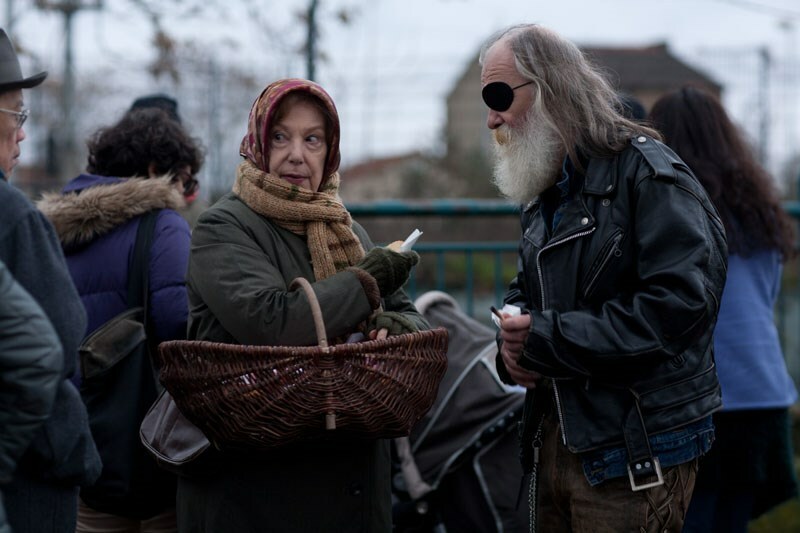 She has seen the exact opposite happen in her outer Parisian neighborhood. As more and more immigrants moved in, her once quaint patisserie went under, ultimately causing her beloved husband to drink himself to death. The resentful old woman has trouble making ends meet, until she finds her niche in the narcotics economy booming around her in Jérôme Enrico’s Paulette (trailer here), which opens this Friday in New York. Paulette’s son-in-law Ousmane (or Osama as she calls him) and her parish priest are of African descent, but that does not stop her from making the rudest racist remarks in their presence. She is even frosty to her grandson Leo, for the same reason. She is also broke, so she gleans some information from Ousmane and approaches Vito, the drug captain for her housing project for work. She starts out as a street pusher, but quickly develops a loyal clientele who feel more comfortable buying from her than a young unsavory gangster. However, she really hits her stride when she starts whipping up hash baked goods. Business is so brisk she soon recruits her card playing cronies. Of course, she will not be able to keep her drug business on cruise control indefinitely. 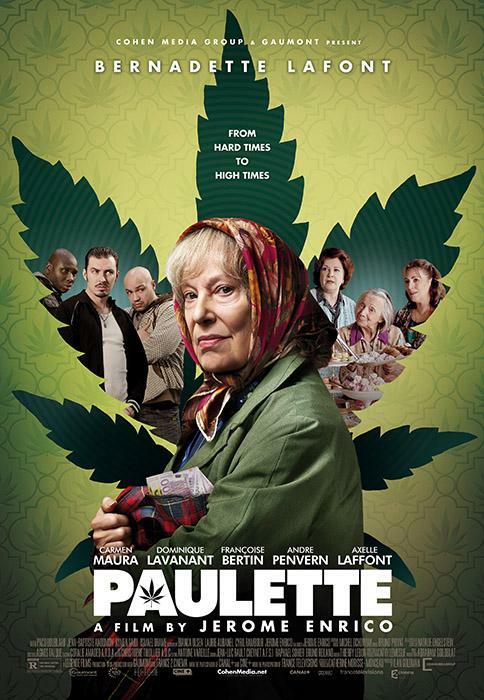 If merely seeing a French granny pushing dope holds sufficient novelty for you than Paulette will not disappoint. However, films like Pushing the Elephant and the Fantasia-selected Ryuchi and His Seven Henchmen are far superior films about senior citizens going (or staying) gangster. Hmm, do you suppose Paulette might warm to little Leo once she starts mixing with more diverse associates? Frankly, the film works best when it shows the unreconstructed Paulette venting her spleen. At least, these darkly comic scenes have an edge and some integrity. Once lessons start to be learned, the film simply craters into sentimentality and shtick. The late great Bernadette Lafont was a Nouvelle Vague veteran, probably best known for her work with Claude Chabrol. This probably is not the film to remember her by, but it still shows flashes of her greatness, especially in her early, flintier scenes. It is sort of mind-blowing to see Carmen Maura, the frazzled Pepa in Women on the Verge of a Nervous Breakdown getting cast as frumpy seniors, but Enrico and his battery of co-screenwriters (Laurie Aubanel, Bianca Olsen, and Cyril Rambour) could have at least given her a more sharply defined character. Unfortunately, except for Lafont, everyone is merely playing types. Despite all the safe and easy choices Enrico makes, there is still some substance to its portrait of a woman embittered but not defeated by life in today’s Paris, which is nicely served by Michel Ochowiak’s peppy yet bittersweet score. Frustratingly, the film is mostly harmless, when it could have been lethally cutting. Okay for patrons of French cinema looking for something non-threatening, Paulette opens this Friday (8/14) in New York at the Paris Theater.